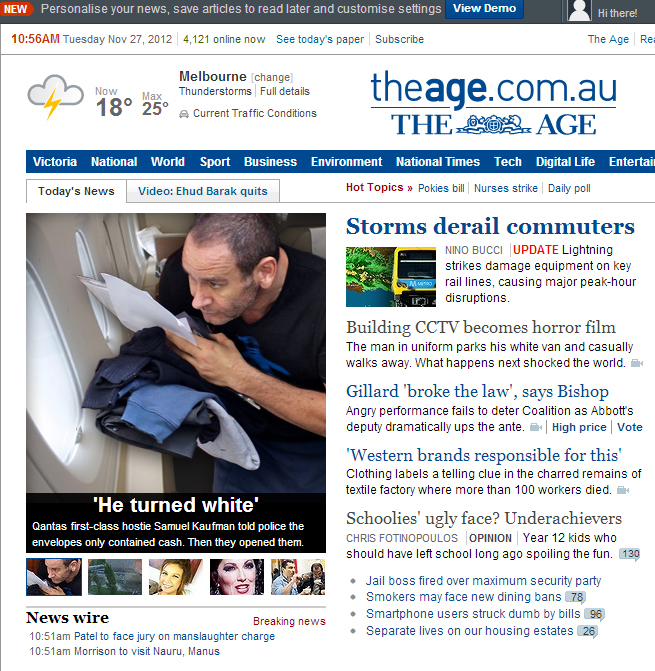 Fairfax have today launched a new front page on their news sites, to coincide with the move to compact sized newspapers. Personally, I think it's disappointing they didn't do something more adventurous. 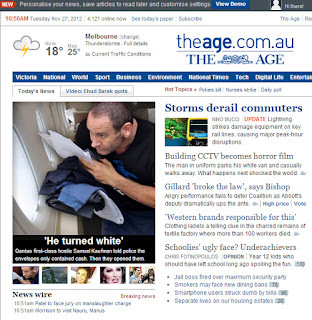 I understand that they wanted to take the sites upmarket and avoid being criticised for being "tabloid" (theage.com.au and smh.com.au have had that accusation thrown at them for years). And I get that they really, really don't want to alienate existing readers. But they could have been more, well, interesting. They could have made this project a small statement about Fairfax's digital competency and intent. Instead it just feels like a missed opportunity. Is the media reinventing influence? Darren Burden and Catherine Lumby discuss the changing nature of news delivery and its impact on journalism. "Culture eats strategy for breakfast" is one of those throwaway lines loved by PowerPoint jockeys and business motivational speakers (with apologies to Peter Drucker). But in the case of newspaper organizations it has a particular resonance. A recent survey by the US based Project for Excellence in Journalism has shown what many in the digital side of publishing have known for years, namely that newspaper executives deserve the blame for not changing the culture of their newsrooms. The failure to find a successful business model in the transition to digital is really a failure of leadership. "The core cultural issue, executives told the PEJ researchers is the tension between the old ways and the new ways — and some of that stems from newspaper leadership that came of age in the days of monopoly newspapers and 20% profit margins. “'We haven’t needed innovative people,' explained one executive. 'So you get what you need. The kind of people that came into this industry were more operationally focused, executors instead of innovator risk takers.'" One daily newspaper the researchers looked at with a circulation of less than 50,000 struggled with the change to a web-first organization because, although its managers acknowledged the importance of the new medium, they didn't reinforce that desire through their reward and accountability systems. "Print revenue and circulation remained the benchmarks of success, not digital revenue or pageviews. As a result, newsroom staff struggled to develop the kind of online content needed to expand the web audience." This same attitude, driven by either short term revenue fears (swapping print dollars for digital cents) or ignorance, or both, has played out across Australian news organizations over the last ten years. There is an Us and Them divide between print and digital staff which is only just beginning to close in some of the more enlightened newsrooms. But still, digital people are being "grinfucked" (as an old boss of mine used to say) by print staffers and seeing their skills and contribution being undervalued as print "news talent" moves into newly created digital specialist positions. As the print iceberg melts, or the deck burns, the refugees looking to jump aboard the digital lifeboats has increased. And just like an overloaded metaphor, the digital lifeboat is at risk of sinking. News organisations finally lost their early mover digital advantage in terms of raw audience some time over the last 18-24 months. While Facebook and Twitter saw exponential growth, and Google was experimenting with Wave, Buzz and Plus, news publishers dithered. They waged hopelessly naive campaigns against Google and debated endlessly whether a paywall strategy was the right direction. Meanwhile, they stopped any broadly meaningful digital product innovation choosing to put all their chips on iPad apps, which at best have been a qualified success. All in all, it has not been a period of distinction for the industry. And once again, the inertia and lack of energy reveals a problem with the leadership. Donald Graham, chairman of the Washington Post Company has admitted some of these failures. When asked recently by Vanity Fair if there was anything he wished he had done differently, looking back over his life at the Post, he said that he “replays” the mid-90s when the Post was first starting its web operation “all the time". "We knocked it out of the park. We were in the help-wanted business three years ahead of anybody else. We started it with great editors and exceptional sales and marketing people, and we had good I.T. people, but we should have tripled up on that. We should have understood that this wasn’t a matter of presenting the news in another format. But I think every company in the news business would tell you the same thing." There is certainly a consistent pattern. One of those patterns is the ever recurring question: what is the future of print? As a medium news print may survive in a form analogous to classic music, or specifically opera. In other words, as a museum piece for a certain class of cultural animal. Frankly, it's the wrong question. A better question is: how do we ensure the viability of energetic journalism? Some news organisations are addressing this question seriously, and attempting to resolve the crippling issues that continue to prevent them from wholesale cultural reinvention. There is a new crop of younger media CEOs now, not all with ink in their veins. It's a good start. 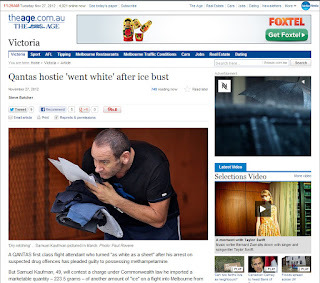 But is it too late to prevent news publishers experiencing their own Kodak moments? Just caught up with this brilliant piece of brand advertising from The Guardian.